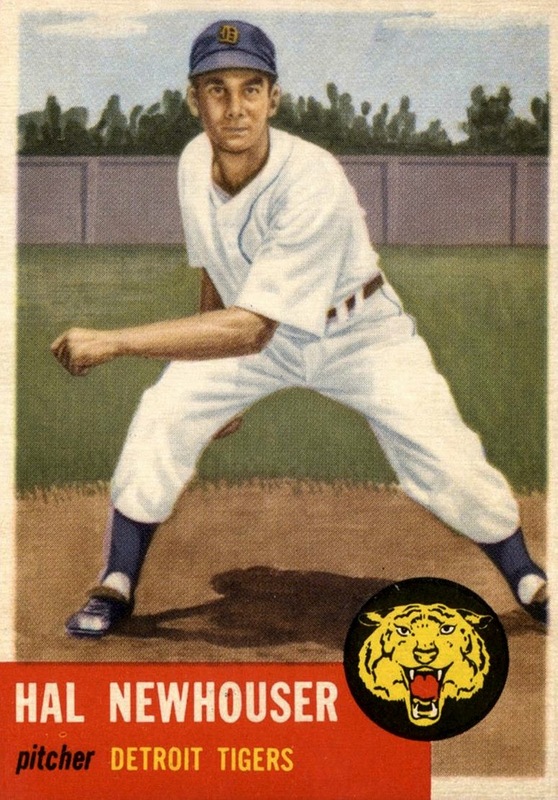 I'll start today's entry by saying farewell to Sy Berger, whose guiding hand in what "baseball cards" mean today reached well beyond the Topps Chewing Gum (T.C.G.) offices. Keith Olbermann did a nice job saluting our modern hobby's most influential creator, in matching bubble gum pink blazer. 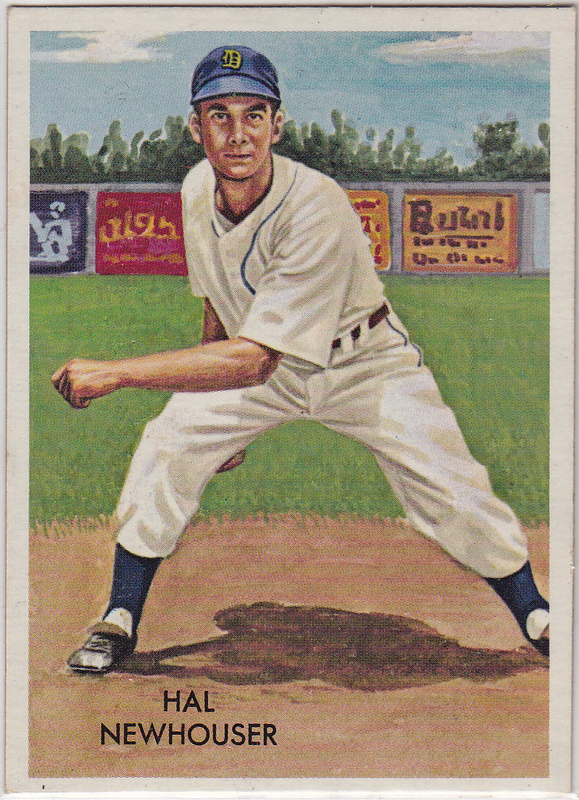 My own post dives into similar "retro" ground via a long-awaited show find, the #5 type card from a Topps test printing created on the 20th anniversary of their own elegant, hand-painted 1953 set. Sy Berger might've created the 1952 cards on his dining table, but the follow-ups showed real artistry. Hobby catalogs sometimes call this 1973 set a "1953 reprint," but even a cursory inspection shows it's a repurposing (and improvement) of 1953's original painting, with no other reference to the earlier design. 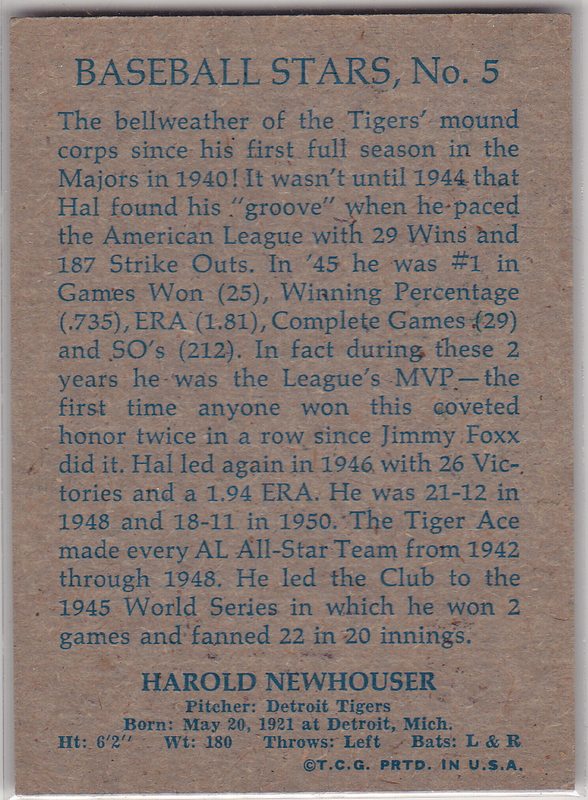 Newhouser's 1973 card restores significant details, like the ads on the outfield fence and additional "depth" in his uniform. No 1950s or 1970s Topps base set used the full-text back style seen below, which more closely resembles a 1950s Bowman card. In fact, these 1973 fronts and backs nearly match 1951 Bowman. Topps bought Bowman's player contracts and art assets in 1957 after the former competitor's bankruptcy, so this design re-use could've been an intentional choice and well-known within the Topps offices. 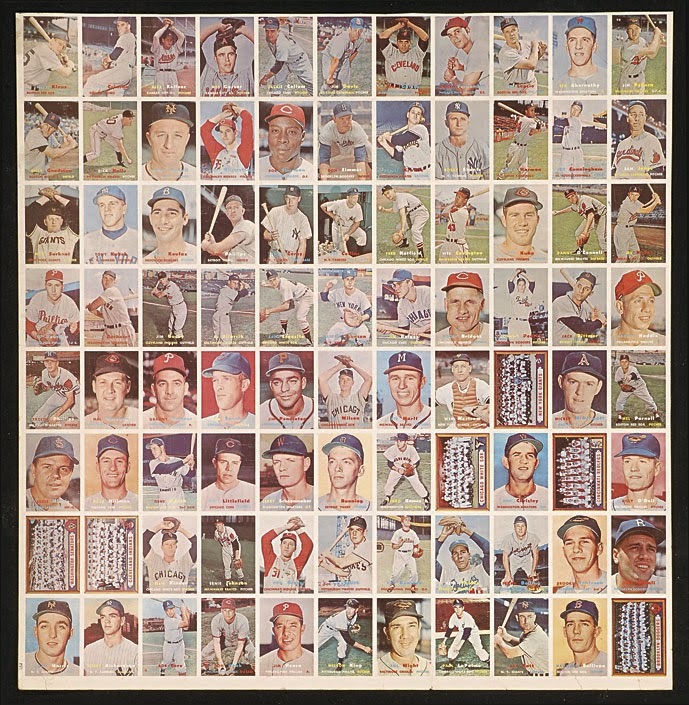 The 1973 set's 8 players include both HOFers and lesser-known players, without an obvious theme that connects them all. Might this set have honored a group of actual guests for a Topps special event? Probably not, given its three mislabeled players, and, if the 1973 date's correct, any intended event would've been undone by Jackie Robinson's passing in late 1972. This set might've come together just because those eight paintings from 1953 were the easiest to find in their company archives. Topps tested a lot of set concepts in the early 1970s and I think Woody Gelman or another Topps editor mocked up this design to consider inserting into current products. For whatever reason, 1953's "reprints" didn't make the cut and remain treasures found in auctions and (very occasionally) show tables. For decent front and back scans, check out this set auction from Huggins and Scott. Value: I bought this EX-MT Newhouser for $35 at a 2014 show table, a decent price in my opinion. Bigger names like Robinson and Paige naturally command bigger prices and the few cards I've seen were all in nicer grades. Fakes / reprints: Haven't seen any reprints of these "reprints" and they're likely too obscure to profitably fake. Finding a type card won't be cheap, but keep your eye on eBay for one of the lesser-known singles to get at least a decent deal. 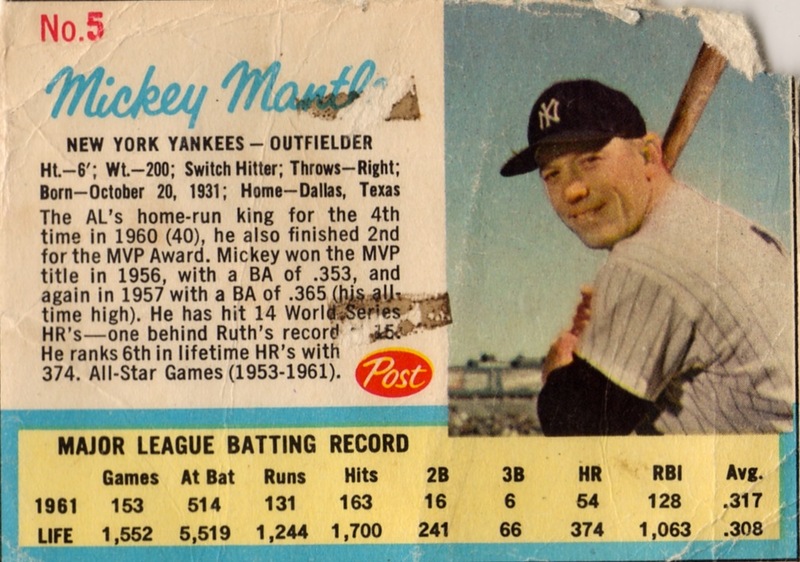 This post tracked progress on a Good-to-VG set of 1957 Topps. Like many OBC members, I started with a low-grade, Poor-Fair set, and later upgraded to "intact," with no paper loss, trimming, writing. eBay supplied my last upgrade hit in #295, Joe Collins, a Yankee from the scarce mid-series. Want to know more about the set itself? 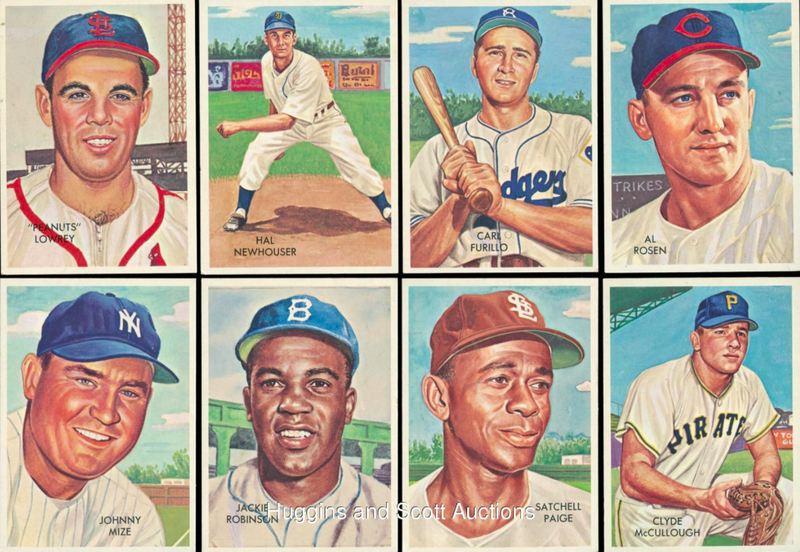 1957 marked several formative steps for Topps, who continued to set standards for what "baseball card" means today. 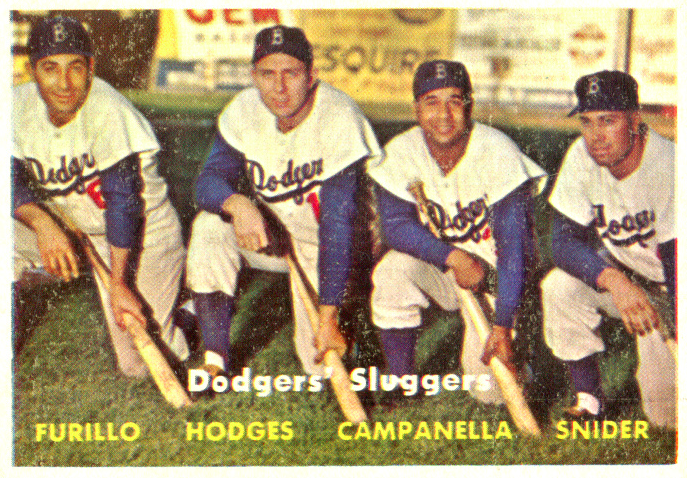 Prior to 1957, Topps printed baseball sets on 2-5/8" x 3-3/4" cardboard, visibly larger than today's 2-1/2" x 3-1/2". 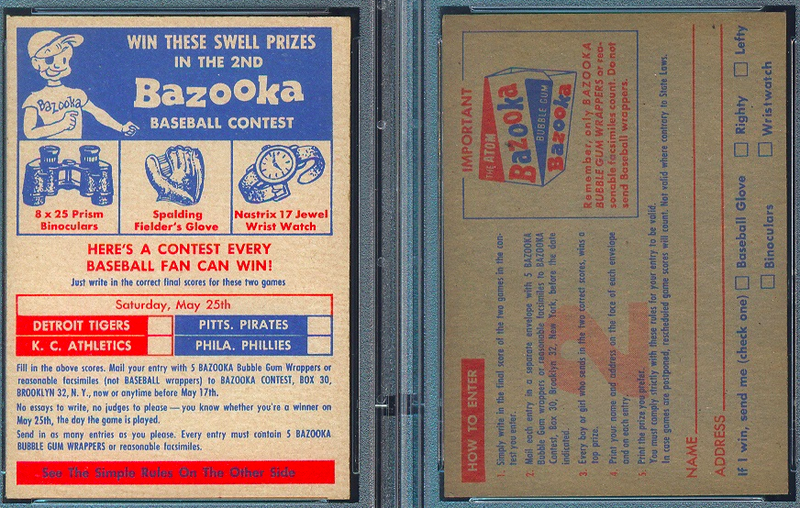 Once top competitor Bowman went out of business in 1956, Topps lowered production costs by trimming a bit off both dimensions. 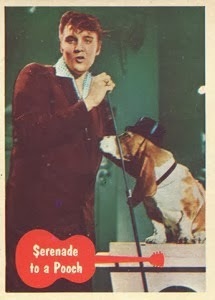 This smaller size debuted in late 1956 for their 66-card Elvis Presley set. 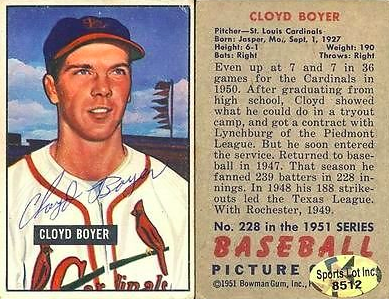 Topps also resized their baseball cards to 2-1/2" x 3-1/2" for 1957 and it remains there to the present day. Full-color photos from the Elvis set also made their way to Topps baseball in 1957. Bowman attempted a full set of photo-color cards in 1953, but reverted to hand-tinted sets for 1954 due to high printing costs. 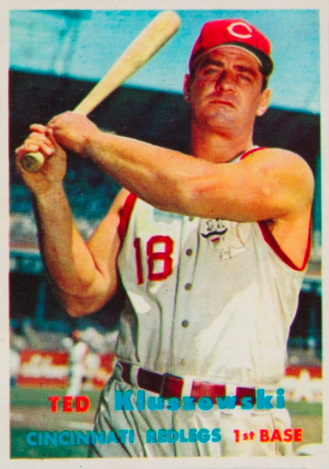 Topps stuck with hand-tinted player images through 1956, then switched to color photos from 1957 on. 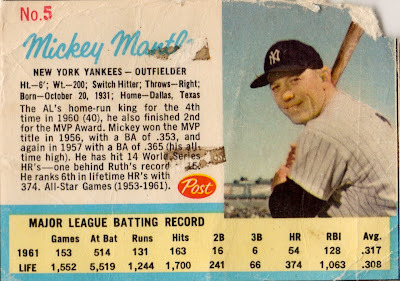 Many Topps issues from the 1950s and 60s have a run of lesser-printed cards, typically the "high numbers" released near the end of each season. They expected lower sales during this period, as many fans would switch to non-baseball interests, or at least buy different trading cards with their gum money. 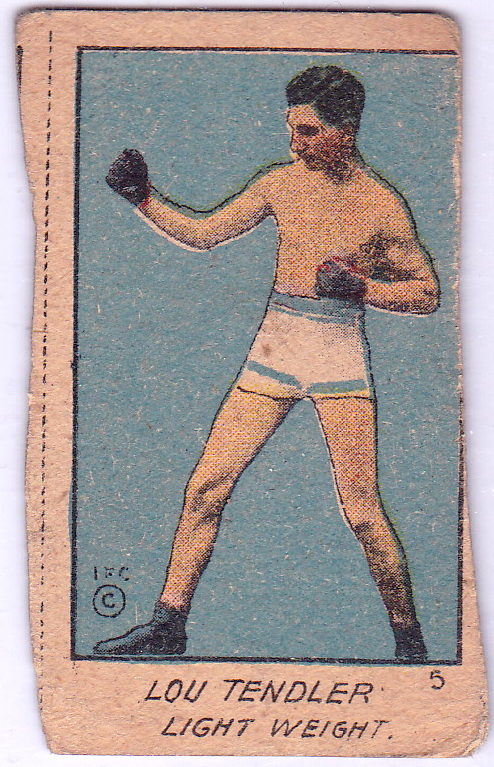 1957, on the other hand, is sparse in its next-to-last series (#265-352). I assume that either A) earlier series undersold Topps' expectations, leaving less money to print this run, or B) mid-series printing problems required removal of a bunch of sheets prior to packaging. Either way, you'll spend more tracking down those 88 cards than any others in the set. Brooklyn said goodbye to its Dodgers after 1957. My favorite parting shot is this multi-player card starring four of their biggest names. 5. 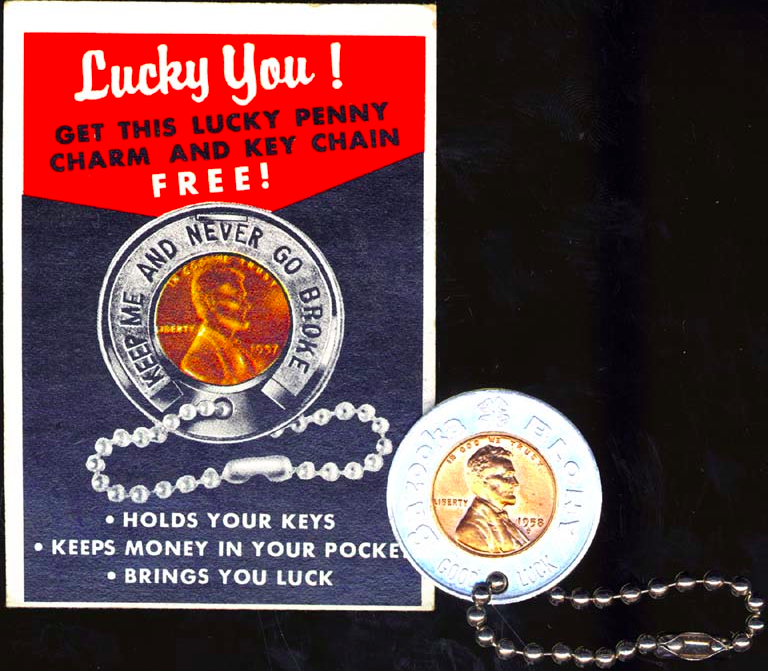 Dated contest cards & the "lucky penny"
Topps took the novel step of adding a date-specific contest to packs shipped from May to July, offering prizes in exchange for correct game score predictions. The dated contest cards (May 4, May 25, June 22, July 19) aren't well-known to the average collector, but hint at how often Topps shipped new products to their distributors and retailers. Many kids must've mailed in these promos, because few remain in the hobby today. OldBaseball.com friends TJ Valacak, Wes Shepard, and Lynn Miller have all helped with upgrades. Thanks, guys! Feb 2: Here are a half-dozen recent pickups from eBay. Kaline's off the upgrade list! 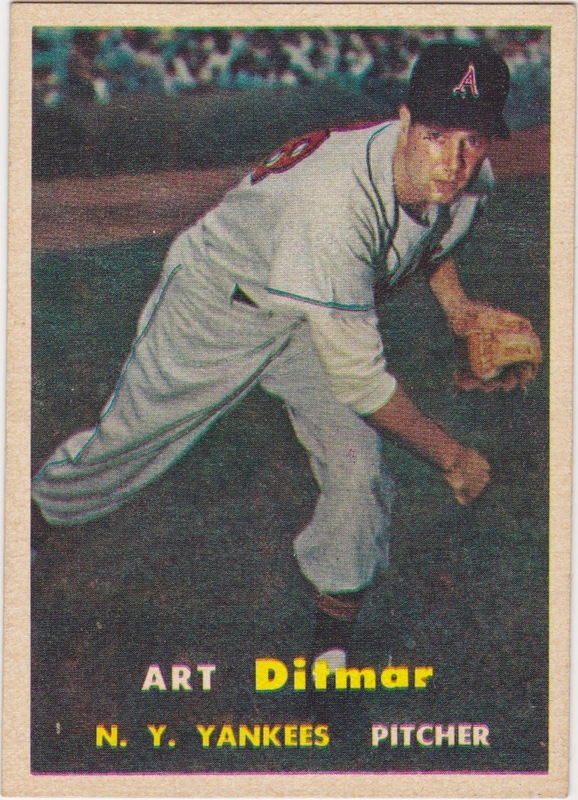 Sept 6: Made some upgrade hits at the 2014 National in Cleveland and grabbed this sharp-cornered Art Ditmar off eBay for $1.75. "Traded by Kansas City Athletics with Bobby Shantz, Jack McMahan, Wayne Belardi and 2 players to be named later to New York Yankees in exchange for Irv Noren, Milt Graff, Mickey McDermott, Tom Morgan, Rip Coleman, Billy Hunter and a player to be named later (February 19, 1957); New York Yankees received Curt Roberts (April 4, 1957) and Kansas City Athletics received Jack Urban (April 5, 1957) and New York Yankees received Clete Boyer (June 4, 1957)." Oct 12: #102 Ray Boone arrives from eBay! TRIVIA BONUS: Ray's son Bob and grandsons Bret (and later Aaron) became the first 3-generational baseball family when Bret debuted on August 19, 1992. 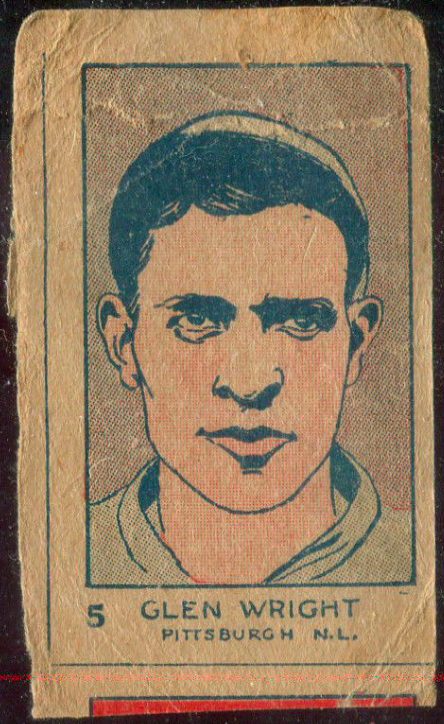 Oct 16: Two more eBay hits, Frank Sullivan and the Cubs team! 1957's Cubs finished two games better than 1956's Cubs under the first-year tutelage of Bob Scheffing. Despite a gradually improving W/L record, he never broke .500 and Chicago lost patience, parting ways with Bob after 1959. Detroit picked up the still-young skipper for 1961, where Scheffing won 101 (!) games in his AL debut, missing the pennant only because New York won 109. 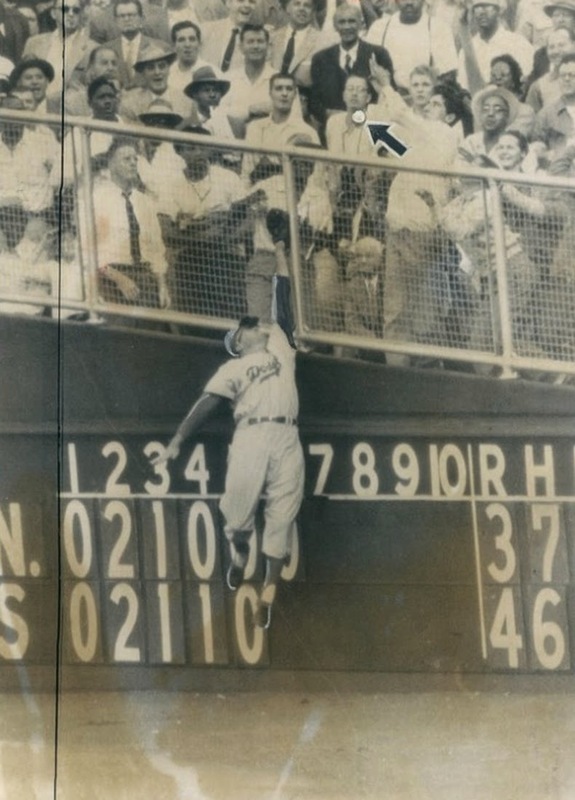 Joe Collins slugged two homers in game one of the 1955 World Series and here's a great shot of Duke Snider leaping for the second. 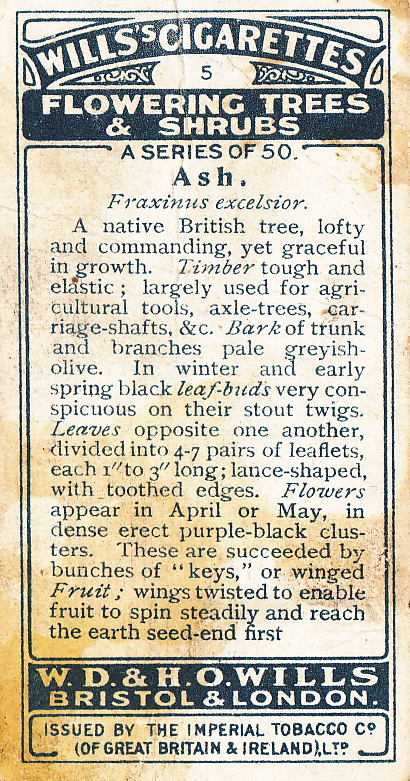 We're not done looking at my incoming wave of British cigarette type cards, not by a long shot. This time, I'm including recent arrivals from Aaron, another friendly trader in OBC. All five of these #5s come from 1920s tree and flower-based sets. These artsy sets feature their own hand-drawn horticultural charm, but there's no way I'll ignore the baseball connection from their "biggest" example: Ash. Ash timber generated millions of bats over baseball's long history and it remains a popular option because ash's softer fibers break less often than fragile woods like maple. Louisville Slugger offers three finishes for their MLB Grade ash models, including this classic "natural gloss" look. If you're a fan of our pastime's materials and technology, check out "Maple vs. Ash & More: Which Wood Type for Baseball Bats?" That article's more throught-provoking that the back of this #5, which reads like a Wikipedia page of italicized plant parts. That linked article also calls out bamboo as a top modern material, one I'd never considered for that purpose. Bamboo's easier to grow and regrow, but must be layered with composite glue to reach the proper thickness, so it isn't the "single piece of wood" mandated by current MLB rules. Our league will need to unravel a ton of regulatory red tape before pro hitters can heft a stick made of bamboo or any other "new" material. Checklists for today's five #5s, four from 50-card sets and one from a series of 25. 1924 Wills "Flowering Trees & Shrubs"
1925 Wills "Flower Culture in Pots"
That 1923 Player set calls its #5 a "plant hypocrite," but I think each day is a struggle for existence, so hey, let's give those hard-living plants a break. It's a weed-eat-weed world out there. Thanks for all the flora, Aaron! 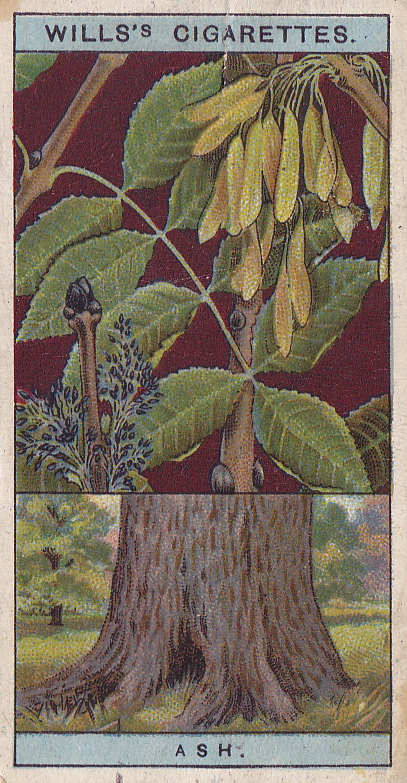 Readers can look forward to another round of exotic tobacco cards soon. 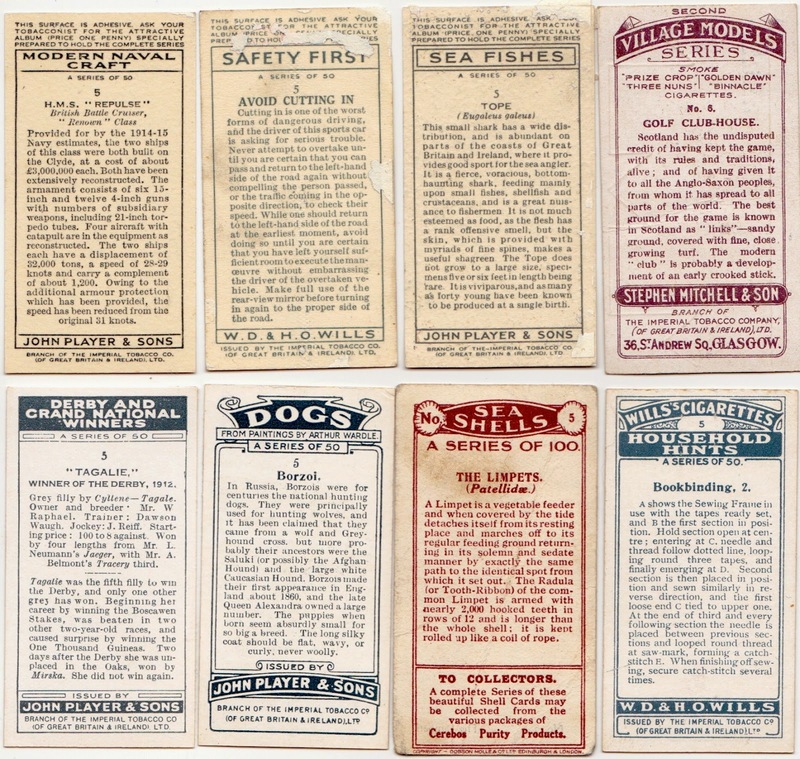 Value: British cigarette cards proved so popular that modern supply exceeds popular demand, so prices remain low. You can find complete sets for $25 and singles for $1. 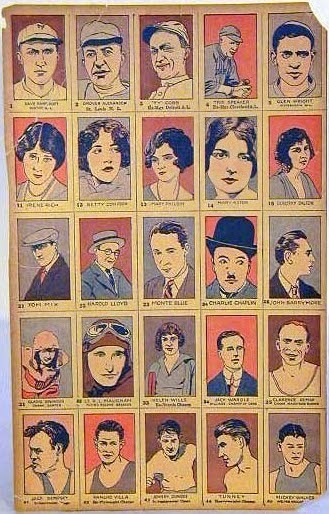 Fakes / reprints: Many 1920s and 30s cigarette sets went through one or more reprints after 1990. Look for a "reprint" tag or glossy, thinner paper stock on the modern versions. 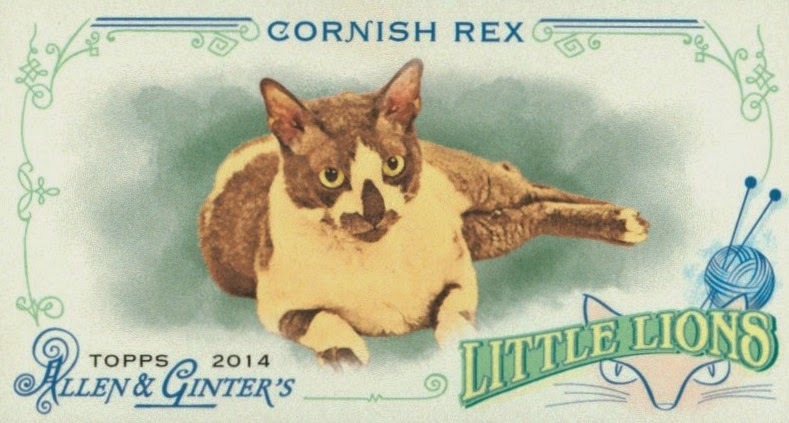 Last time in the blog, I thanked OBC trading friend Glenn for an excellent stack of UK cigarette cards that covered a variety of subjects and this post shows another handful from that type card swap. It's hard to replicate this range of cards stateside without a complete run of Topps Allen & Ginter subsets. My benefactor might be twice-happy to get that regal card (12th Century English monarch Henry II) out of his collection. On Sept 18, Glenn's adopted home of Scotland voted not to leave the UK, shelving their independence for the near future; see arethescotsindependentyet.com for more. In Scotland's honor, let's take a closer look at that royal ruler hedgehog. 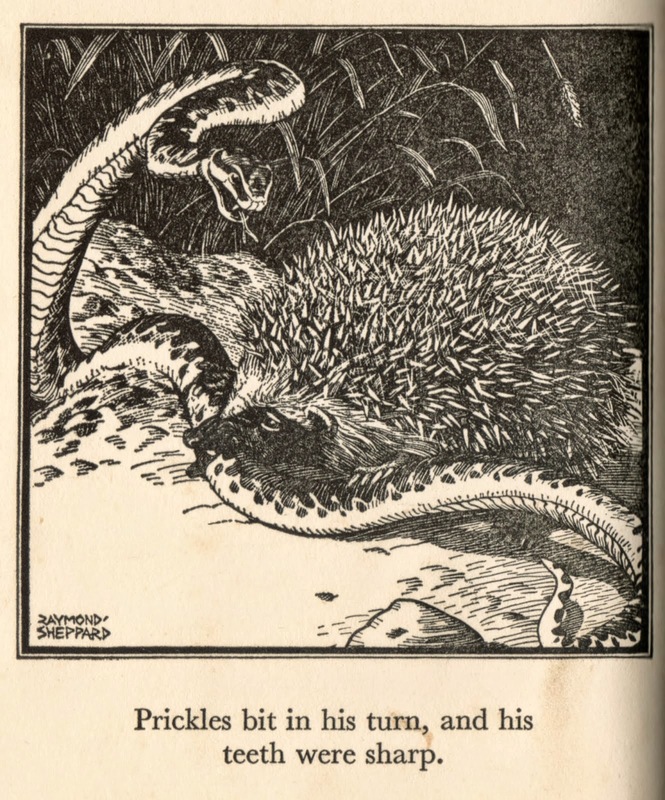 The hedgehog's card text emphasizes their genteel diet and nocturnal nature before closing with a zinger ... "our picture shows [it] in combat with a viper." Was its writer going to ignore that part of the hedgehog canon until he saw their art? 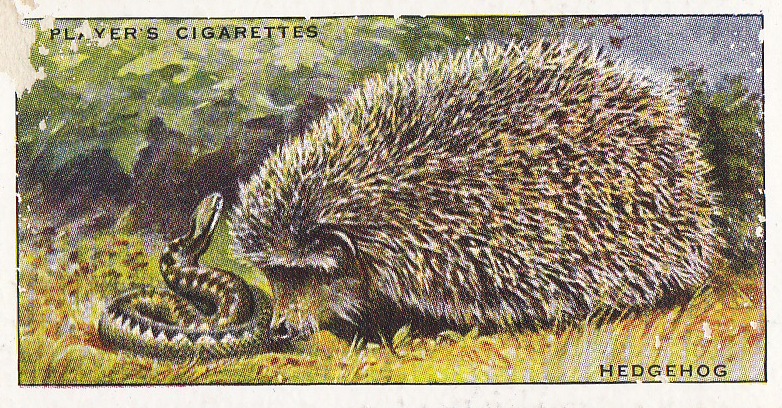 If you like hedgehog drama, this scene from an illustrated 1938 storybook varies from the Player's Cigarettes card only by using a bigger snake. I suspect the era of British (and European) colonialism made exotic animals fascinating to citizens throughout the Empire, so any fight between a pointy football and poisonous snake gained extra emotional heft. 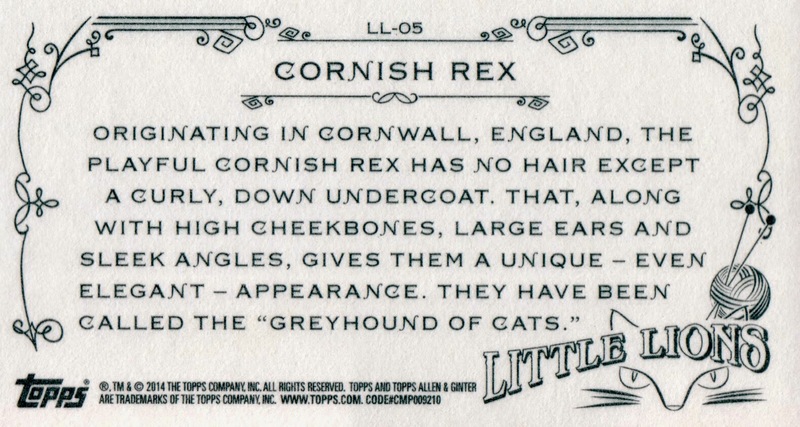 Finding good scans and checklists for UK cigarette sets is less reliable than for USA baseball, but auction site Delcampe.net offers front and back scans for all 50 Animals of the Countryside. Value: That Delcampe auction link sold an original set for £21 in 2011, so you won't go broke buying them in lots or singles. Fakes / reprints: Many cigarette sets, including Animals of the Countryside, went through one or more reprints after 1990, typically with a REPRINT tag and shinier paper stock. 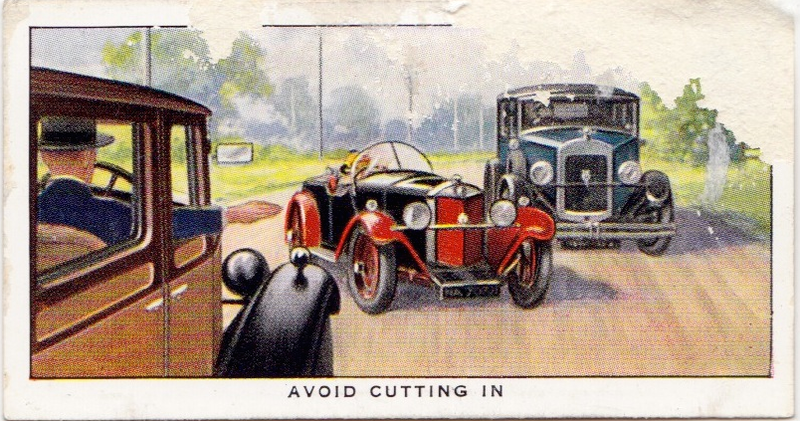 1930s British Cigarette Cards : Models and ships! Limpets and Sharks! Borzois and bad driving! If you collect modern Allen & Ginter cards, it can seem baffling how Topps finds so many random subjects to turn into one "normal" set. Irresistible cat cards, anyone? 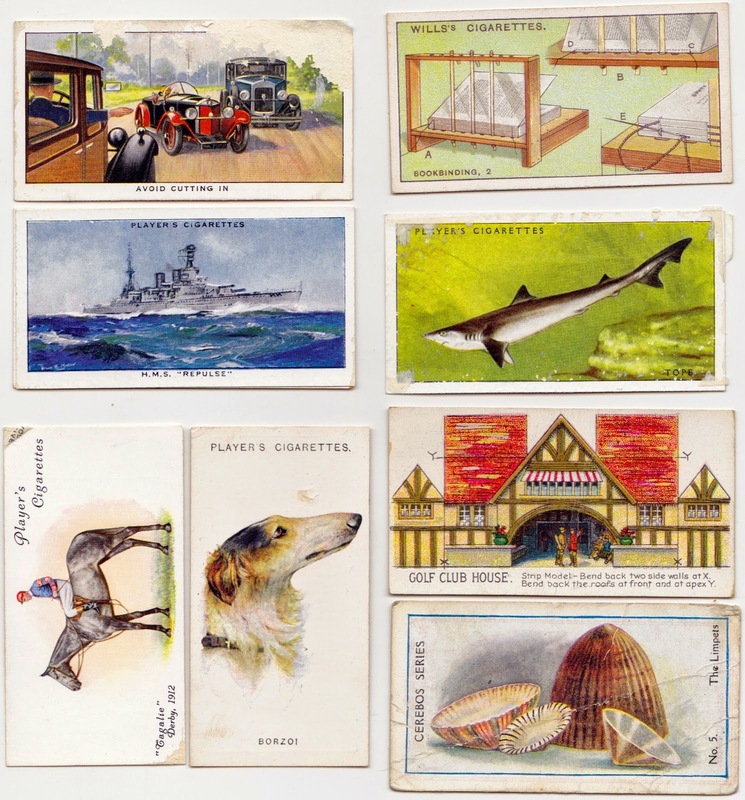 For a seminal look at how war machines, natural wonders, technological advances and sea creatures all rate inclusion in a modern set, look no further than the wild and wooly world of British cigarette cards. Throughout the 20th century, companies perked up their packs with hundreds of subjects, from household objects to hammerheads. These #5s represent a tiny fraction of what's collectible, as catalogues count over 15,500 known sets. My eight type cards came to the USA via a Scottish OBC trading friend (thanks Glenn!) and are easy to learn more about from their textbook backs. 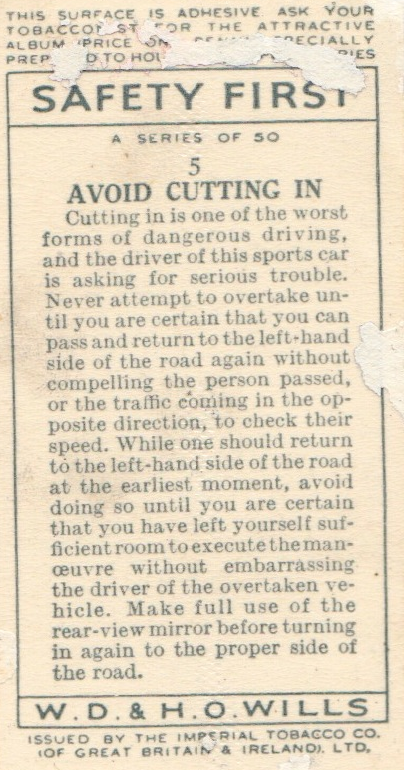 Here's a closer look at my favorite of them, the 1934 "Safety First" series, as packaged with W.D. & H.O. Wills cigarettes. This set boils down to "what terrible fates we suffer thanks to The Wheel." Cards, bicycles, and toy hoops all create scenes of danger that the Wills' author then admonishes against. 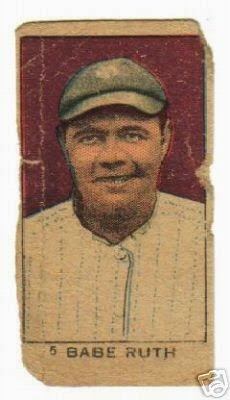 Value: The good news is that British tobacco cards don't cost much compared to American baseball cards from the same 1920s & 30s time period. The Safety First set runs under $40 on eBay. 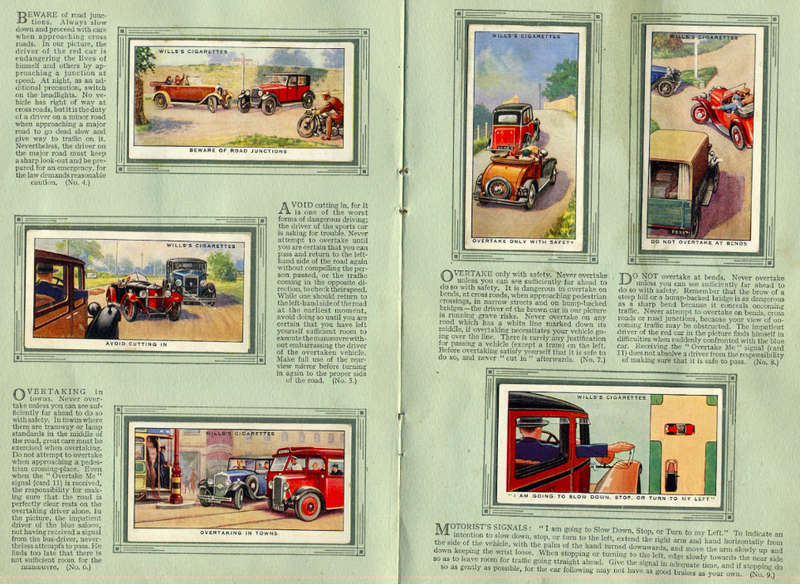 Fakes / reprints: Many 1930s British sets have reappeared as modern reprints. Look for "reprint" in the card text or glossier, modern paper stock. Even with little money at risk, it's better safe than sorry. 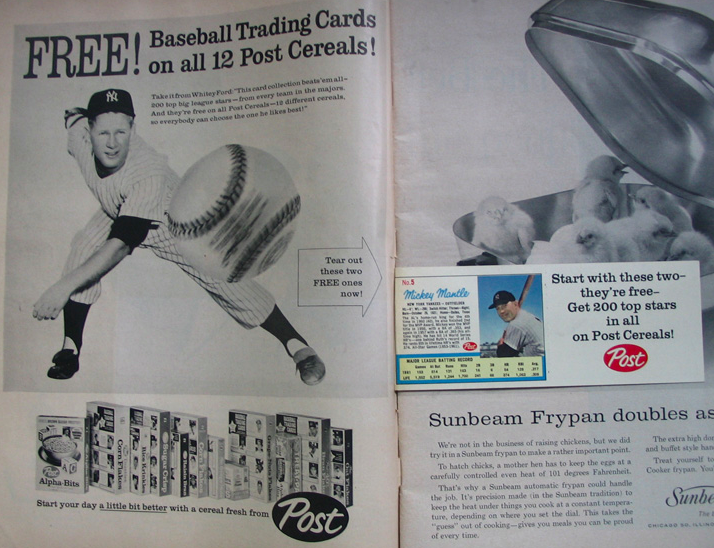 After Mickey Mantle and Roger Maris's spell-binding race to break Ruth's single-season HR record in 1961, Post Cereal went all-out promoting the Yankee teammates in their 1962 set. 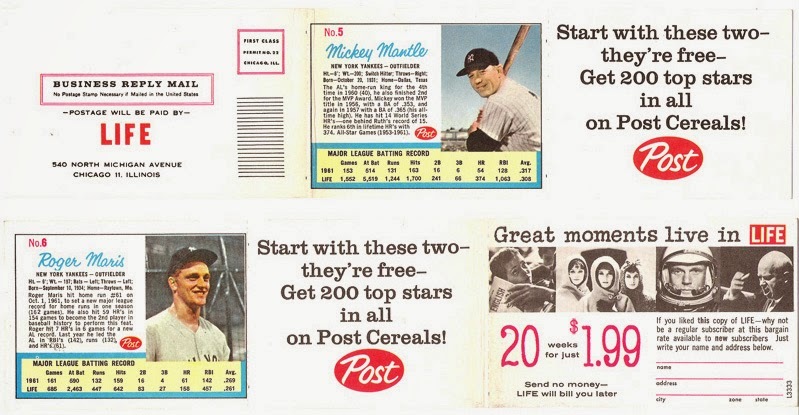 They published another set of on-box cereal cards, pushed those cards via print, radio, and TV spots, and even added a French-translated version for Canadian baseball fans. 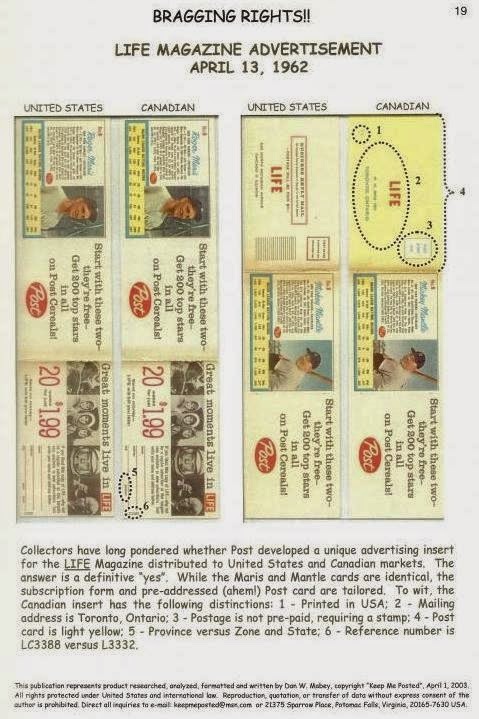 Today's entry highlights the advertising that coincided with 1962's Opening Day, when Maris & Mantle appeared on 2-card inserts in LIFE magazine. Although originally part of a larger ad, most collectors trimmed Mickey down to the size that's part of my type collection. 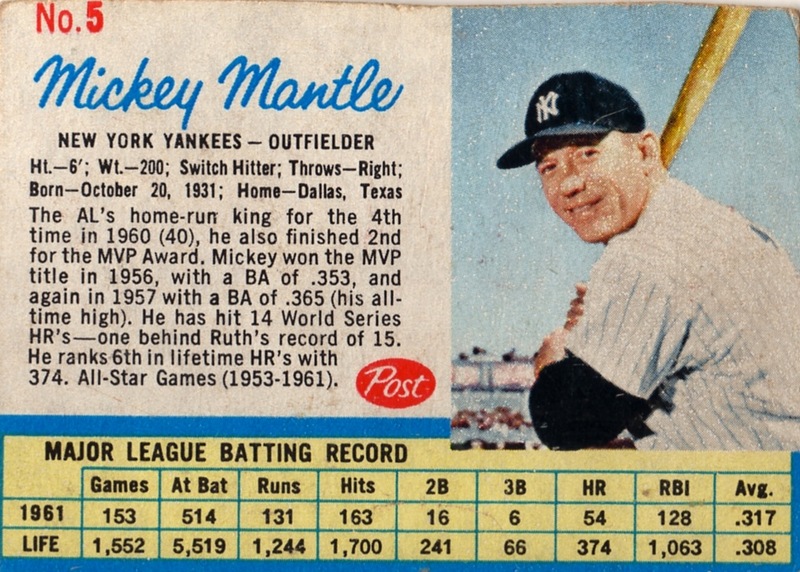 At first glance, this Mantle looks similar to his 1962 Post Cereal box card, but lacks the blue grid lines around his stats. Close inspection also shows his photo's re-cropped along the bottom-left edges. Also compare my trimmed version to this full-bordered LIFE promo, which linked Mantle and Maris on side-to-side perforations. The scan's from an Aug 2014 Mantle/Maris auction that closed for $40. CenturyOldCards.com "misc" listings includes a complete April 13, 1962 LIFE magazine with this insert positioned opposite a full-page Post ad starring Whitey Ford. 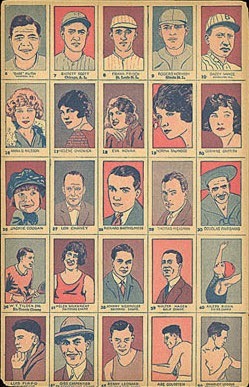 Mantle's facing toward the reader, with the back of Maris's card to his right. Post gave Mantle himself a spoken line in this 60-second spot targeting (surprise!) both boys and girls as collectors. UPDATE: Thanks to this Net54 thread on 1962 Post, I learned LIFE magazine inserts vary slightly from US to Canada. While both cards are the same, its addressing changed to fit the Canadian mold. Value: Due to tight trimming and a torn corner, my #5 Mantle cost only $5 plus postage on eBay. Expect to pay more for well-trimmed singles, a full Mantle-and-Maris page, or complete magazines with the insert. Fakes / Reprints: I haven't heard of any LIFE counterfeits, probably because they're valued far below his regular Topps cards. This two-sided printing would take more "work" than faking a Post cereal card and probably isn't worth the time, unless you copied the full-page ad sheet.